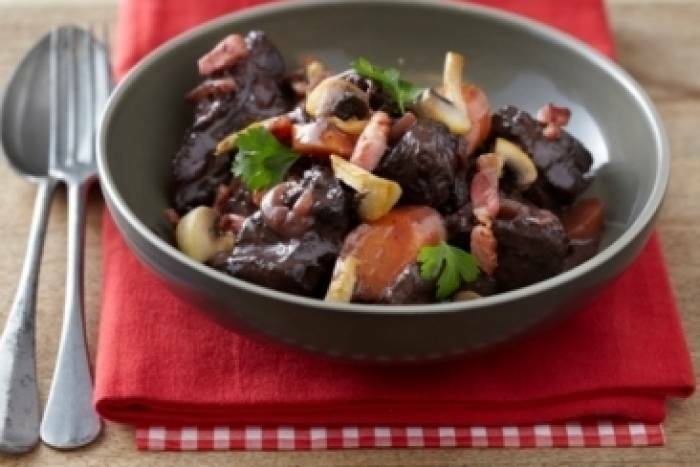 A classic, warming and homely dish - slow cooked beef in a red wine stock. Trim the fat from the meat. Peel the carrot and the onion then cut in to fine slices. Soak the silver skin onions in warm water for 5 minutes then peel. Use a knife to peel the mushrooms. Cut the pork belly into cubes. Pour 2 tablespoonfuls of sunflower oil in to a large saucepan or stewing pot then colour the meat for about 1 minute on each side. Add the onion and carrots to the pan, season with salt and cook for a further 3 minutes. Add the flour and cook for another minute, mixing well to really incorporate the flour. Add the red wine, reduce by half and then add the veal glaze. Crush the garlic cloves with your hand then add to the pan with a few sprigs of parsley. Bring to the boil, lower the temperature and simmer with a lid on the pan for 2 hours. In the meantime, place the silver skin onions in a frying pan. Add water to half the height of the onions, 20g butter and a tablespoonful of sugar. Cover with a sheet of baking parchment and cook until all the water has evaporated. When the sugar begins to caramelise, add a tablespoonful of water and coat the onions in the caramel. Place the pork lardons in a saucepan of cold water and bring to the boil to blanch them. Drain well then sear in a hot, non-stick pan. Set aside on some kitchen towel. Add two tablespoonfuls of olive oil to the pan and saute the mushrooms. Set aside. Once the meat is cooked, remove from the stewing pot and pass the sauce through a fine sieve. If the sauce is still too liquid, reduce for a few minutes. Taste and season with salt and pepper. Serve the meat in the centre of large dinner plates, pour over the sauce and add the onion and mushrooms garnishes. Serve with boiled potatoes.